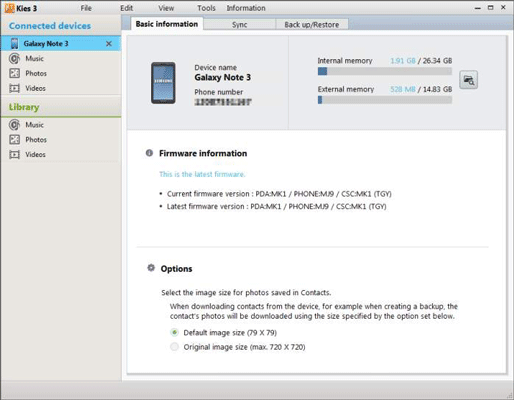 The Samsung way to connect your Samsung Galaxy Note 3 phone to a computer is to obtain and use the Samsung Kies program. A copy can be downloaded to your computer (PC or Mac) from the Samsung website. Ensure that you download the proper version of Kies for the Galaxy Note 3. After you download the program, run the program to install it on the computer, and then you are ready to begin. When you run Samsung Kies, it begs you to connect the Galaxy Note to the computer by using the USB cable. Do so. If the phone uses a sophisticated screen lock, such as a PIN or password, unlock the phone so that the Kies program on the computer can access the phone’s information. After Kies starts, you see its main screen. You can synchronize music, photos, and videos by using Kies. To copy files to the phone by using Kies, use the File menu. Choose File→Add File to Galaxy Note 3→Internal (or External) and then choose the file to send over. If you don’t like Kies, don’t use it. Simply close the program’s window after it starts. If an update is looming for the Galaxy Note, the Kies program alerts you. Follow the directions on the computer screen to update the phone’s software.